I could spend pages raving about how good The Witcher 3: Wild Hunt is. Rarely do I hand out this score, and I think that speaks volumes about this game. This is easily one of the best games of 2015, but beyond that it is the best fantasy RPG I have played to date, alongside being the best open-world game since Rockstar’s phenomenal Red Dead Redemption. The result is still a game that often feels like a stunningly confident, competent shot across the bow of the open world genre, folding in an incredibly strong narrative and a good sense of consequence to the decisions that present themselves throughout, presenting a fun bit of combat creativity into a genre that desperately needs it. With that going for it, The Witcher 3 is a great game though it isn't a classic — and it can carry a somewhat qualified recommendation. Though the straightforward and fetch-quest-heavy main story overstays its welcome, the option of joyfully adventuring through a rich, expansive open world was always there for me when I’d start to burn out. Even if the plot isn’t terribly interesting, the many characters who play a part in it are, and along with the excellent combat and RPG gameplay, they elevate The Witcher 3 to a plane few other RPGs inhabit. Had it not been mired by bizarre lapses in design and a plethora of disturbing problems, The Witcher 3: Wild Hunt would be almost bloody perfect. As it stands, CD Projekt Red has still put together something downright delicious. A truly great game that rises its head above its own hot water to proudly present a prosperous experience that only the most deliriously expectant could feel shortchanged by. 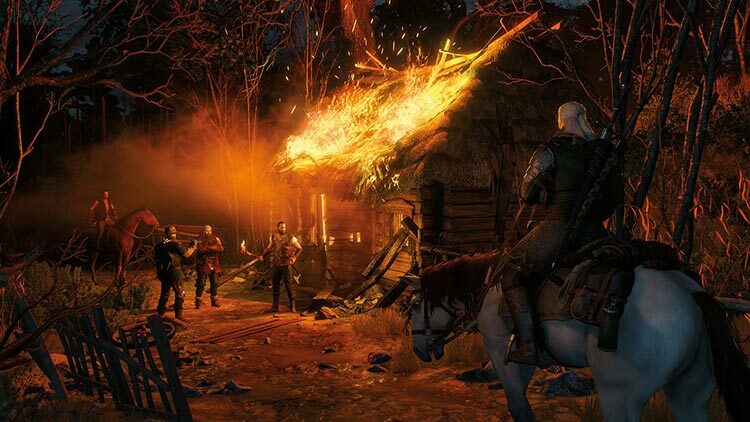 There is no question The Witcher 3: Wild Hunt delivers a superb ‘Triple A’ RPG experience. Featuring some of the best story telling we have seen so far this year and an unforgettable, dynamic and vast open world, Witcher 3 stands as a must own for not only fans of the franchise but those looking for rich experience they can soak 100+ hours into. Some of the glitches, bugs and other small annoyances hamper the experience but the pros outweigh the cons as the Witcher 3 is a journey worth taking. 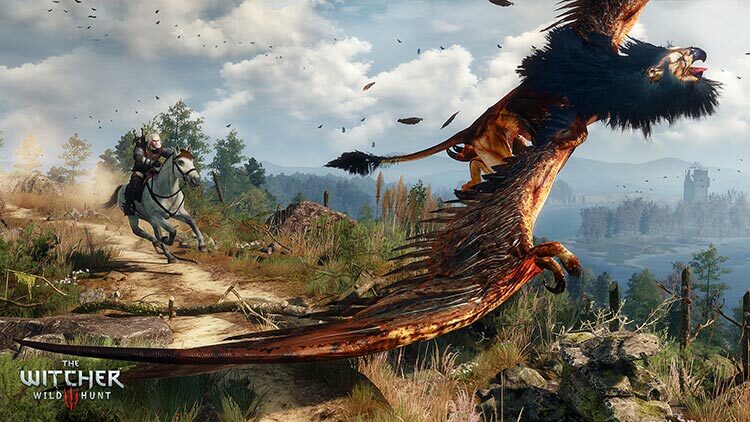 The Witcher 3: Wild Hunt is a stupendous achievement for CD Projekt Red. 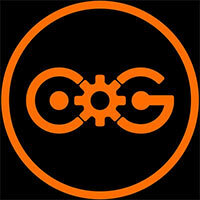 This is a studio rich in love for the RPG genre, and it shows. With each consecutive release, their craft has been finer and finer tuned. If Wild Hunt is any indication, the next game from the Polish band of gamers will be something to behold. Most of you are probably already playing Wild Hunt and loving it. ...This is not one you want to miss. The Witcher 3: Wild Hunt an absolute classic. The Witcher 3: Wild Hunt is an emotional cavalcade across an enormous, compelling world that shows the love and sweat poured into its creation in every tree, building, character and quest. It’s almost everything I ever wanted from RPGs and open world games combined, and hopefully it will set an example for future games within the same space. 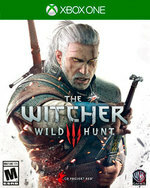 Where the Witcher 2 sputtered to a halt, The Witcher 3 is always in a crescendo, crafting battle scenarios that constantly one-up the last, until you reach the explosive finale and recover in the glow of the game's quiet denouement. But while the grand clashes are captivating, it is the moments between conflicts, when you drink with the local clans and bask in a trobairitz's song, that are truly inspiring. Even without the promise of future content that's already been revealed through the game's $24.99 Season Pass, the game is large enough to support hundreds of hours of play. It's easily one of the most fully featured RPGs sitting right next to Dragon Age: Inquisition. In a world with post launch DLC that promises to enhance the core experience, Witcher 3 can get by completely without it. Kudos CDPR. Even with these complaints, The Witcher 3: Wild Hunt is one of the best RPGs I have ever experienced in gaming. There’s so much to this adventure, you’d be missing out on a great experience if you pass it up. 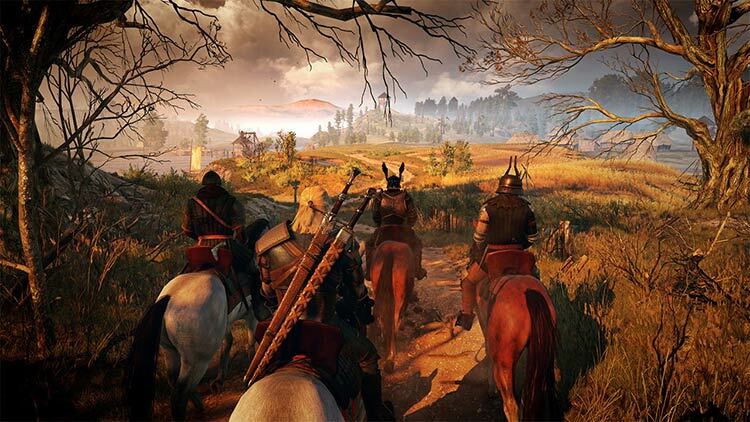 The Witcher 3: Wild Hunt is a colossal game rich with story, content, and landmass. But it's a case of bigger isn't always better. It spends a great deal of its energy trying to impress the audience with unparalleled scope. 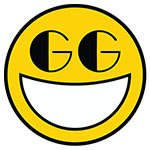 The result is an experience that succeeds in its mission of being a grand experience, but commonly missteps when it comes to fundamentals such as combat, leveling systems, and user interface design. If you're good enough at the game to keep yourself away from the icy clasp of death and prefer travelling across the land rather than using the fast-travel option, you’ll scarcely see a loading screen anyway. Move over Skyrim; take a seat, Dragon's Age. 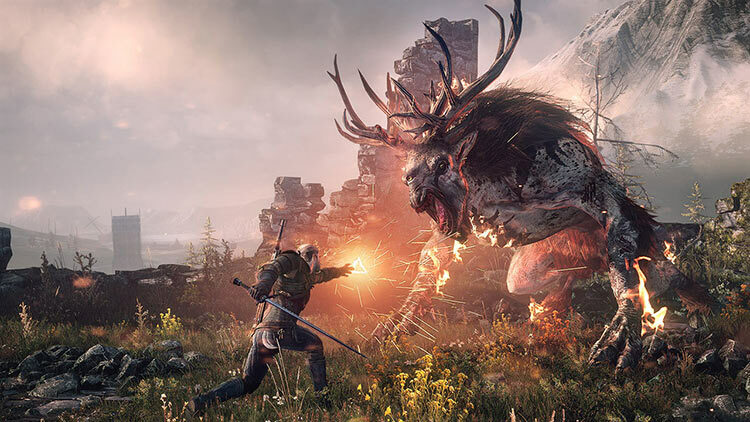 There's a new game in town, and that game is The Witcher 3: Wild Hunt. Despite a main quest that meanders a bit too frequently, The Witcher 3 excels at giving players an unbelievably large and beautiful open-world that is brimming with meaningful things to do. 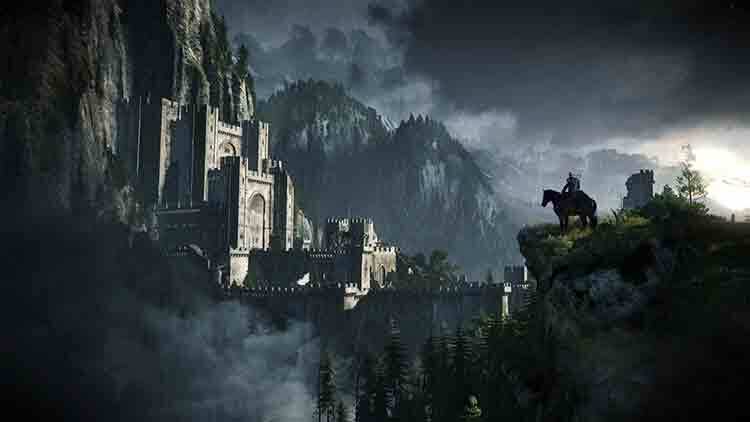 While the scope of the adventure may often leave players intimidated and overwhelmed, CD Projekt RED has crafted The Witcher 3 to be its most accessible game yet. If you stick with it until the end, you'll be blown away by its engrossing world, riveting characters, and deep combat system. It's a crowning achievement from the developer, and it's a definite contender for game of the year. Tel un sortilège complexe, The Witcher 3 est un mélange de Dark Fantasy, d’écriture finement ciselée et de maîtrise technique. Haletant, passionnant, immersif, immense par ses ambitions et la taille de ses environnements, le jeu est une réussite sur tous les aspects. ...Puissance du scénario, qualité des graphismes et jouabilité délectable participent à nous plonger dans une aventure épique et mature dont on éprouve le plus grand mal à décrocher. Une oeuvre que tout amateur de jeu de rôle se devrait d’essayer ! Même avec ses quelques problèmes techniques et son ambition visuelle revue à la baisse, The Witcher 3 demeure un titre enchanteur, un jeu envoûtant et somptueux. Bien campé sur une direction artistique cohérente, incarnée, qui nous offre un regard encore plus acéré sur le monde boueux et nauséabond de la série, ce troisième épisode est tout de même d'une qualité visuelle rare, qu'on attend de pouvoir apprécier sur la plateforme de prédilection de CD Projekt Red. Dinamik hava koşulları, aydınlatma ve çevrenizdeki detaylar daha önce hiçbir açık dünya oyununda görmediğim bir incelikle işlenmiş. Bu konuda CD Projekt’i suçlayabilirsiniz ama gördüğüm onca şeyden sonra inanın benim içim el vermiyor. Bu oyuna hayranlık duymak veya bir firmayı çok sevmekle alakalı bir şey değil. Oyun hem harika görünüyor hem de çok stabil çalışıyor. Ara sahnelerdeki ufak düşüşler haricinde PlayStation 4’te çok iyi iş çıkartıyor.